(from Punch)An employee of Access Bank Plc, Mr. Femi Badejo, and his security guard, Joshua Moses, were shot by policemen in Lagos on Saturday after they responded to a distress call about a robbery at the banker’s home in Ikota area of the state. PUNCH Metro learnt that the robbers had attacked Badejo and his neighbours around 4am and one of the neighbours made a distress call to the police, but by the time the policemen arrived about an hour later, the robbers had fled. Badejo said he and his neighbours were in the compound discussing what had transpired when the policemen stormed the building and started shooting sporadically. He is currently receiving treatment at St. Nicholas Hospital, Lagos Island. Badejo said, “I live in a one-storey building and there are four tenants occupying the ground floor. Around 4am, armed robbers stormed our house. 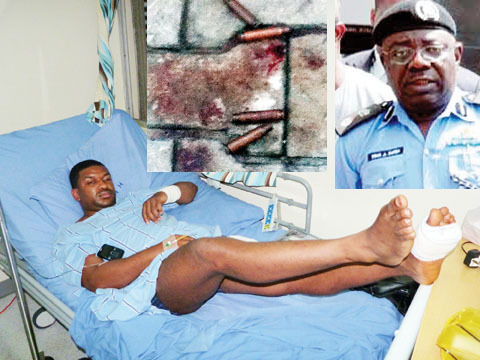 Badejo said after the robbers had fled, scores of policemen arrived at the house while one of them started shooting indiscriminately, adding that he was hit five times. He said, “We (neighbours) were all inside the compound counting our losses when we heard a bang on the gate. Immediately the security guard opened, one of the policemen started shooting indiscriminately. “The security guard was shot in the pelvis and in the back but the bullet pierced through his chest. I immediately took cover under a car but the policeman came to where I was and started shooting at me. “Another policeman came behind me and shot. The first shot came through my feet and fractured my leg. Two shots grazed my thighs. Another shot went through my biceps and came out, while one went through my wrist. Badejo added that it took the intervention of the other neighbours as well as the Divisional Police Officer of the station to prevent him from being killed. Badejo and the injured guard were immediately rushed to the hospital. The guard was subsequently transferred to General Hospital, Broad Street, and then Lagos State University Teaching Hospital, Ikeja. He is said to be in a critical condition. One of our correspondents learnt that Badejo was scheduled to give a lecture at a summit organised by the bank on Saturday. According to a colleague who craved anonymity, the company executives were curious when he did not show up as scheduled. He said, “Badejo is in Total Quality Management Department at the head office. He is part of the team working on the 21st century transformation which the bank is working on. He was supposed to deliver a lecture at 8.30am but when we did not see him, we began to wonder what went wrong. On Tuesday, a commercial motorcycle rider, Adigun Atilola, was shot by a policeman at Ilupeju during the clampdown on okada riders. The following day, a policeman, Oluwatiyesi Gboyega, also allegedly shot and killed a bus conductor during an argument over N50. A call placed to the spokesperson for the state police command, Ngozi Braide, on Sunday was not answered and neither did she reply a text message sent to her on the shooting of the banker and securityman.